WA Roller Derby’s first bout for 2012 took them to Bunbury where a newly formed team met Bunbury Roller Derby’s Brawl Stars on May 5. 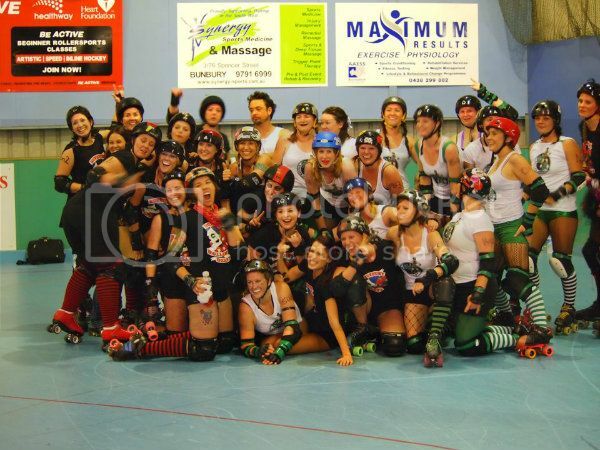 With the WARDs of the Skate deep in training to compete in The Great Southern Slam, WARD’s less experienced skaters teamed up with a handful of stalwarts and went up against the Bunbury girls at the punk showdown God Save The Derby. With the ever brilliant Hot Wheels jamming and veterans Ophelia Terror and Bruiser Von Basher leading the team to an early lead in the first jam, WARD managed to stretch out a comfortable lead from which to give new skaters greater responsibility on the track. While Bunbury’s girls hit hard and had no mercy, they found themselves in the penalty box more often than WARD in the first half and paid a heavy price. New WARD jammers Cass O Wary, Soozy Slugworth and Kiss WidaFist fought their way through the pack time and time again and their efforts as well as good team work and smart thinking by the WARD girls kept the margin growing until it stood at 76 to 23 at half time. There was no way the Bunbury girls would shy away from the fight however, coming out with even more power and determination after the break. Jammers Rapainzel, Maykinu Bleed and Smash Potts tore through the packs with ever greater energy and when penalties took a WARD jammer or two off the track they made the most of their opportunities. Meanwhile Heidi Handcuffs, Princess Pinebox and D’Lish Deestructon made a mess of WARD’s defence on the track at every turn. In the second half brave new jammers Volcanic Ash and Bubblin’ Squeaks along with Uzi and Hot Wheels faced up to the newly fired up locals. It was a brutal and hard fought bout, with plenty of lessons for both sides. This time around WARD came out with a win with the final score 163 to Bunbury’s 81. The determined Smash Potts was named MVP for Bunbury’s Brawl Stars and Uzi took the prize for WARD. Next up: the WARDs of the Skate will bout in The Great Southern Slam! Our travel team will bout Brisbane City Rollers and Adelaide Roller Derby in the biggest tournament in the southern hemisphere. Help get the team to Adelaide by donating here.